Broadway In Chicago announced the 2019 National Tour of the Lincoln Center Theater Broadway Production of FALSETTOS, William Finn and James Lapine's groundbreaking, Tony Award-winning musical, will play Broadway In Chicago's Oriental Theatre (24 W. Randolph) for a limited engagement May 28 - June 9, 2019. This production was nominated for five Tony Awards including Best Musical Revival when it returned to Broadway in Fall 2016. FALSETTOS will be part of Broadway In Chicago's upcoming season. Subscriptions will go on sale in the fall of 2018. 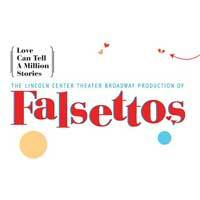 FALSETTOS will join the line-up of performances at the annual Broadway In Chicago Summer Concert, sponsored by ABC 7 Chicago and hosted by Janet Davies, ABC 7 Chicago's entertainment reporter and host of the entertainment and lifestyle program 190 NORTH on ABC 7. The Broadway In Chicago Summer Concert will take place on Monday, August 13, 2018 at 6:15 p.m. at the Jay Pritzker Pavilion at Millennium Park (201 E Randolph St). The North American Tour of The Lincoln Center Theater Broadway production of Falsettos is directed once again by James Lapine. The production has choreography by Spencer Liff (Emmy Award nominee for FOX's So You Think You Can Dance), sets by David Rockwell (Hairspray, The Normal Heart, She Loves Me), costumes by Jennifer Caprio (The 25th Annual Putnam County Spelling Bee, Joseph and The Amazing Technicolor Dreamcoat), lighting by Jeff Croiter (Bandstand, Something Rotten! ), sound by Dan Moses Schreier (A Gentleman's Guide to Love & Murder, Gypsy with Patti Lupone), casting by Eric Woodall / Tara Rubin Casting, and features Michael Starobin's (Assassins, Next to Normal) original orchestrations. FALSETTOS revolves around the life of a charming, intelligent, neurotic gay man named Marvin, his wife, lover, about-to-be-Bar-Mitzvahed son, their psychiatrist, and the lesbians next door. It's a hilarious and achingly poignant look at the infinite possibilities that make up a modern family... and a beautiful reminder that love can tell a million stories. This production of FALSETTOS marks a happy reunion for composer/lyricist William Finn and playwright/director James Lapine. In 1981, Finn and Lapine's new one-act musical March of the Falsettos premiered at Playwrights Horizons' second floor 75-seat space. The story of a gay man named Marvin, his lover Whizzer, Marvin's wife Trina, son Jason, and their psychiatrist Mendel, March of the Falsettos was a critical success, described by The New York Times as "a musical find." It eventually moved to Playwrights Horizons' larger downstairs theater for an extended engagement before enjoying a long run Off-Broadway at what was then known as the Westside Arts Theatre. In 1992, the two one-act musicals were combined into one and opened on Broadway as Falsettos. Falsettos ran for over a year at the John Golden Theatre and won Tony Awards for Finn's score and Finn and Lapine's book.